Meet BB-8™ - the app-enabled droid by Sphero. Guide your Star Wars BB-8 with a smartphone or tablet! This droid has an adaptive personality that changes as you play! Set it to patrol autonomously. Create and view holographic recordings. Over the years, the magic of Star Wars has always lived on screen and in our imaginations. Thanks to advancements in technology, it's now possible to bring a part of Star Wars into your home. Meet BB-8, the app-enabled droid by Sphero that's as authentic as it is advanced. This BB-8 has something no other robot has - an adaptive personality that changes as you play! Based on your interactions, BB-8 will show a range of expressions and even perk up when you give voice commands. Set it to patrol and watch your droid explore autonomously; make up your own adventure and guide BB-8 yourself; or create and view holographic recordings. It’s now possible to explore the galaxy with your own trusty astromech droid by your side. Measuring about 4 1/2-inches tall x 2 9/10-inches diameter, BB-8 is more than a toy - it’s your companion! 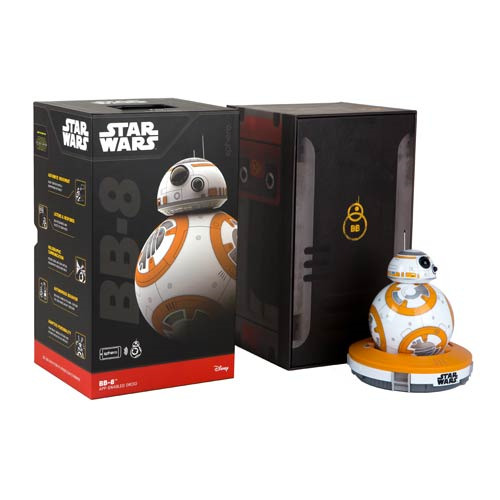 The BB-8™ App-Enabled Droid by Sphero comes in international packaging. Ages 8 and up.